Bet these 2019 Women’s World Cup Odds with 888Sport or Betfair. Since 1991 we have been enjoying the Women’s World Cup every four years, as the eighth edition of the tournament kicks off in June which will take us to the final match to be played on July 7 in Lyon, France. The draw that placed the 24 teams into group stage was held on December 8, 2018, and the competition will take place in France for the first time, with the United States being the defending champs after their third World Cup win in 2015. The USWNT also has a runner-up finish and has earned three third-place honors from the previous seven Women’s World Cups, and they are the favorites among top football bookmakers, including 888Sport, to take home trophy No. 4. Here’s an early look for football betting fans at the Americans’ group and prospects, relying on solid women’s football betting strategy. Oddsmakers have issued two sets of lines for the 24 participants vying for the hardware: overall winner and odds to finish in the top-4. The United States team has a +225 favorite expectation, and you will have to pay -215 to collect $100 if you think the USWNT will finish in the top-4. There have been seven Women’s World Cup events, and the USWNT has yet to finish outside the top-3, so that second bet is pricey, but it sure is almost a certainty if there ever was one. Host France has a +350 attached to their odds to win the event on their own soil, a feat that has only been done once before, when the 1999 USWNT won the tournament on penalty kicks over China. Anyone living in the U.S who wasn’t under a rock remembers Brandi Chastain ripping off her jersey as she buried the final kick from the penalty spot in the back of the net to earn the United States their first World Cup trophy. The German team sits at +500 in expectation win their third Women’s World Cup, as it was the only team to have won back-to-back titles (2007 & 2011). They are also expected to a be a top-4 finisher listed at -135 to at least reach the semifinals. The interesting battle for who finishes in the top-4 will be where some good money will be found, as three teams have equal odds to reach the semifinals. England, Japan and the Netherlands each show up at +900 to win the World Cup outright, and they all sit at +175 to be top-4 finisher in France. Brazil and Sweden are outside contenders to win the event, as both sit at about +300 to end up in the final 4. Play these bets at Karamba. 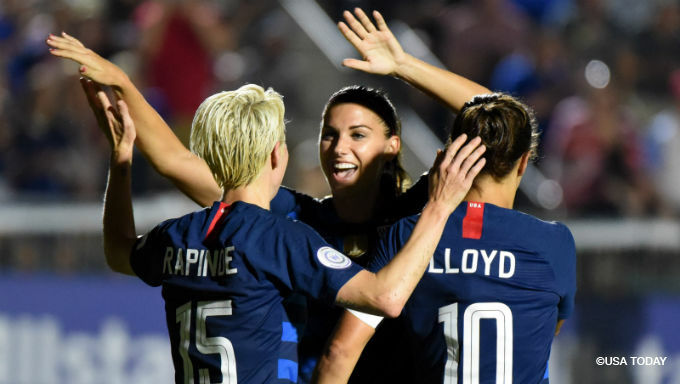 The USWNT has landed in Group F with Sweden, Chile and Thailand, with the United States expected to take the top spot with a -200 expectation from the oddsmakers. Sweden is expected to advance out of the group to the knockout phase of the tournament with a second-place finish in group F.
Chile and Thailand each appear at +1400 to win the group, and that makes it clear that the U.S and Sweden are clearly expected to move on. Should the USWNT be concerned with Sweden stealing the top-spot in group F? You bet they should, because if you look at what Sweden has done recently on the international stage, it is impressive. This Swedish team won the 2018 Algave Cup, and finished with a Silver Medal at the 2016 Olympic Games. And let’s not forget the 7-0-1 record in UEFA World Cup qualifying that saw the Swedes outscore their four Group 4 opponents 22-2 to earn the bid to France. Should the USWNT and Sweden be concerned with Chile and Thailand during group F play? No, they shouldn’t so let’s move on, and it is that cut and dry. There are three Americans among the top-6 contenders to win the Golden Ball Award, as Carli Lloyd leads the board at +400 with 888Sport, while teammate Alex Morgan isn’t far behind at +450. Sydney Leroux comes in with the fifth spot on the podium carrying a +700 line, but Lloyd is certainly worth the price, and should be where you spend your money. Lloyd has 105 goals from her 265 caps, and she only needs 3 goals to become the 4th leading scorer in the history of United States Women’s Soccer (Michelle Akers 107).